Welcome back! How does your car look today??? 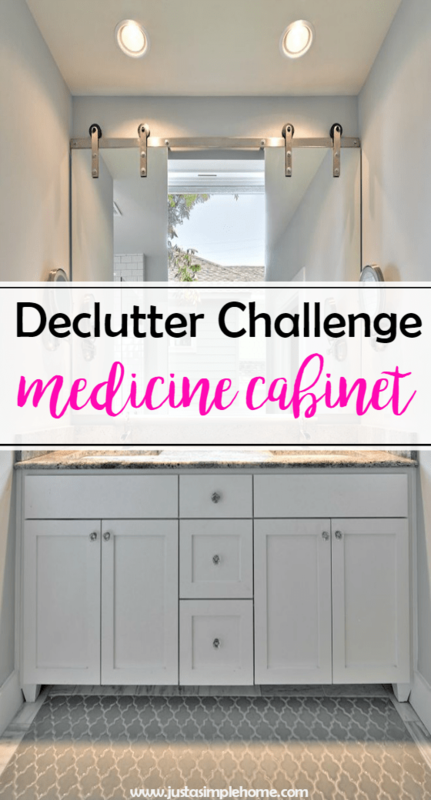 Today’s challenge is an important one- to declutter our medicine cabinet. This one will be quick, but don’t skip it! Where do you keep your medicine? Most people store it in the bathroom, but that is one of the worst places to store medication. Heat and moisture can destroy pills, vitamins and other products, so try to store your medicine somewhere cool and dry. Perhaps you have a shelf in the pantry, or a cupboard, that is high enough to be away from little hands. Having a well organized medicine cabinet will save you stress, time and money. No one wants to have to search high and low for any kind of medicine when their child is sick, only to find everything has expired. The most important thing we will do today is remove all expired pills and medicines. All of them. Take note- you don’t want to throw these in the trash or down the toilet, as they can poison the land and water supply. Most towns have a drop off spot for these, or you can call your local pharmacy to see if they will accept it. Like always- put away any items that belong in other rooms. I know how the cabinet can easily become a clutter magnet. Sort and declutter. Remove the items from your medicine cabinet and assess each one. Wipe out the inside of your medicine cabinet and line the shelves with pretty paper. Return items you are keeping and organize by like item. Put items used frequently towards the front and others in the back. You may want to use a spice rack or tiered shelf to find things easily. Be sure your cabinet is kid-proof, especially if you have little ones. Bag and drop off expired and unused medications at a local drop-off point. As I’m getting ready to sell my house, I’ve been doing a lot of decluttering. My next project today, thanks to you, is tackling my medicine cabinet!! I’m so glad it inspired you, good luck Lindsay! Great tips! I need to do this soon … you give some great tips here. Lining the shelves and good organization really encourages you to WANT to keep a space clean, too! Great tips! If it looks pretty, you’ll want to keep it pretty 🙂 Thank you!